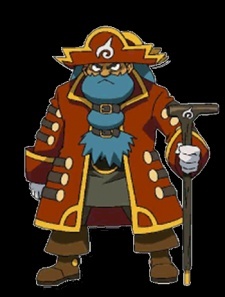 The Phantom (ファントム船長 Captain Phantom) is the leader of the pirates in Pokémon Ranger and the Temple of the Sea. He wants to hatch a Manaphy so he can rule the Temple of the Sea. After finding the Manaphy egg, it was taken by Jack Walker. Like any respectable pirate, The Phantom has a Chatot, a parrot Pokémon, and he uses this Chatot to closely follow Ash and co., and his new friends, Lizabeth and her family. After a battle with Ash imbued with the Sea Crown's power, he was trapped under some rubble until Jackie and the police arrested him.